We’re living in a time of unprecedented change. Some changes are small. Some are enormous. Some changes we can influence, others we’ve no control over and we need to adapt to. Some people hate change, others embrace it. At Levy McCallum we help you change. 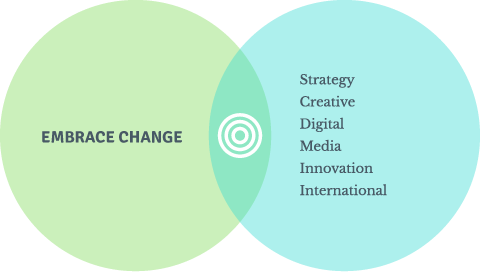 To change strategy, change sales figures, change media response and selection, change return on investment and change customer perceptions. At this stage you might not know what it is you need to change, but if something needs to change, you’ve come to the right place. What’s your marketing strategy? It’s the question we always ask when we first meet. Without a strategy in place how will any of us know if the marketing is working? We’ll help you agree a strategy and put in place measures to achieve it. We can help with research, market, product or insight based. No one understands a client’s business like a client. However some distance can give perspective and all assumptions need challenged. That’s part of our job. Your strategy is at the heart of your marketing and it’s key to achieving sales and business success. Creativity isn’t just clever headlines and attractive designs. Creativity solves our clients’ business problems. Creativity is at the heart of everything we do. It informs our thinking, our approach and our solutions. Our creativity must be inspired by the strategy. It’s not about winning awards, it’s about creating the change our client’s require. Our work is fresh and it’s challenging and it speaks for itself. We’re unusual in that we still have media planning and buying in-house. Our clients benefit from having one point of contact for media and creative. Our creative and media teams work together to ensure each understands what the other is doing, making sure that projects aren’t media-led or creative-led but always strategy-led. Media planning includes digital media, no longer a specialist or separate field, now mainstream and part of every campaign. No area of marketing has changed as much as media in recent years. Keeping on top of it, understanding what new opportunities offer and where traditional media is still good, is essential for clients. We don’t actually see ‘digital’ as in any way separate. It’s simply part of marketing today. However, it’s clear there are still companies who, for a variety of reasons, see digital as a separate discipline. We will help you integrate digital into your business, better understand what it can, and can’t, do and keep you up-to-date with the changes and innovations. Whether that’s a new website, an Automated Marketing campaign or some social media training you’ll benefit from talking to us. We take great pride in keeping our clients informed about new developments and opportunities. We see this as part of our role and an area we can bring real value. Marketing departments are often understaffed and besieged by internal requests. The opportunities for clients to step back and see what’s happening ‘out there’ are few and far between. That’s where we help. Whether it’s a new digital tool, an outdoor media innovation, a new social media channel or a development in printing we’ll keep you informed. We subscribe to Trendwatching and we can see what’s happening in other markets and countries. We attend conferences, subscribe to webinars and read articles. We’re naturally curious, very enthusiastic and excited by innovation but realistic about its uses. We fully understand that Glasgow isn’t the centre of the business universe. Today, it is easier than ever to maintain knowledge and understanding about other markets. Nothing however replaces on-the-ground experience and people. We are members of Taan Worldwide. Membership criteria is strict and constantly monitored. Through Taan we have sister agencies in 32 countries and 57 cities worldwide. For some clients, who are active abroad, this is very helpful for obvious reasons. Taan membership enables us, exclusively, to learn from peers, to discuss challenges, opportunities, innovations and ideas. This benefits all our clients. The world is a much more connected place and having an understanding of that is invaluable. Read the latest thoughts, opinions, news and views from Levy McCallum.